I started running for Winnebago County Coroner every election in 2004. 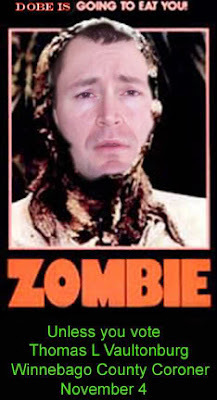 I was America's first Zombie (Z) Party candidate. I created the Zombie (Z) Party. I see now dozens, perhaps hundreds of people have done so since then, but as usual, I was first. In that first election I ran against Ryan Davis, but in subsequent elections took on other competitors from the Werewolf and Mummist parties, including Andrew Davis and Jason SSG. None of us ever received an officially counted vote, but I know we had more support than the press was willing to report. I think a few times we even ran when there was no official County Coroner election, but it was all in fun. And it was fun. As you can see, I have mad Photoshop skills.